Forget the detox, Christmas-level indulgence is the only tried and tested means of beating the January blues. Embracing consumers’ love of over the top hybrids, the traditional Sunday roast and the more recent gourmet burger trend, Borough Market’s Roast Restaurant will launch the ‘Ultimate Roast Burger’ this month. Developed by Head Chef Stuart Cauldwell, the burger will encapsulate the restaurant’s well-loved decadent roast dinners served. The roast potato, rosemary and garlic bun is stuffed with layers of Welsh Black roast beef, carrot piccalilli and horseradish sour cream, topped with melted ale and mustard cheddar, curly kale, and pickled red cabbage. In addition, a red wine onion gravy will be served to accompany. What’s more, the ‘Ultimate Roast Burger’ is promised to use only the finest ingredients, many of which are sourced from neighbouring market stalls. 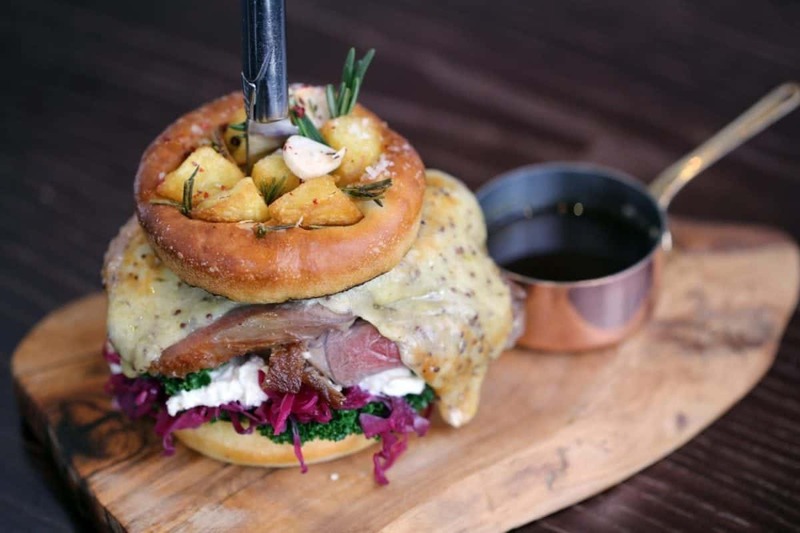 Available from Tuesday (10th January 2017), Roast Restaurant’s ‘Ultimate Roast Burger’ will be priced at £18.50, and is promised to taste “every bit as decadent as it looks”. Further information can be found at roast-restaurant.com.